Schiwago Melodie (Dr. Zhivago) [German] [02:52] Same as on the Zauber einer größen Stimme 20 LP. Also available on the Russisches Schatzkästlein CD. Wenn Ich Einmal Reich Wär (If I Were A Rich Man) [German] [04:52] Also available on the The Very Best of Ivan Rebroff Volume II CD. Wolgalied [?] [03:46] Also available on the Simply the Best CD. La Montanara [Italian] [03:00] Same as on the Zauber einer größen Stimme 20 LP. Also available on the From the World CD. 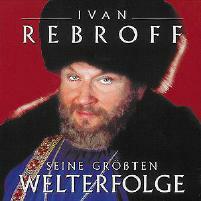 Abendglocken (Evening Chimes) [Russian] [03:40] Also available on the The Very Best of Ivan Rebroff CD. Das Einsame Glöckchen [Russian] [04:09] Also available on the The Very Best of Ivan Rebroff Volume II CD. Kalinka Malinka [Russian] [04:02] Also available on the Simply the Best CD. Im Tiefen Keller [German] [03:56] Also available on the The Very Best of Ivan Rebroff CD. Zwei Weiße Wolken [German] [03:13] Also available on the Come with me to Hellas and The Very Best of Ivan Rebroff CDs. Barcarolle [03:14] Also available on the The Very Best of Ivan Rebroff Volume II CD. Stenka Rasin [Russian] [03:33] Also available on the Crowning of a Great Career and Stenka Rasin CDs. Spiel Zigeuner [German] [03:40] Also available on the The Very Best of Ivan Rebroff CD. Wolgaschlepper (Song Of The Volga Boatmen) [Russian] [02:30] Also available on the Crowning of a Great Career CD. Moskauer Nächte (Moscow Nights) [Russian] [03:59] Also available on the Crowning of a Great Career, Stenka Rasin & Noël Russe CDs. Katjusha [02:14] Also available on the Crowning of a Great Career & Stenka Rasin CDs.